I am giving these away with the help of Rare Bird Lit! A $99 dollar value! This giveaway concludes February 28, 2019. Winners must have a valid U.S. address for shipping purposes. Get eyE Marty for Free! Marty was a professional writer and considered himself a writer first, and an actor second. Feldman created a number of immensely successful and influential shows such as Marty, The Frost Report and sketches for Monty Python. He was one of the most essential creative forces in British comedy embodied also by his close friends and creative partners from Beyond the Fringe (especially Peter Cook and Dudley Moore) and Monty Python (especially John Cleese, Graham Chapman and Eric Idle). Marty Feldman finished, and set aside eYE Marty soon before traveling to Mexico to shoot his final film. He did not know that he would die there, although he certainly felt he might die soon, and was haunted by the notion. The book is exactly as Feldman wrote it: Mark Flanagan had it transcribed, with even the photos inserted where Feldman had noted they should go. Hilarious, deeply charming, aphoristic, ironic, charged throughout with lust for life and filled with scenes of great vanished eras and portraits of other performers and friends, eYE Marty is the amazing discovery of the story of a man who was at the heart of the British comedy revolution. 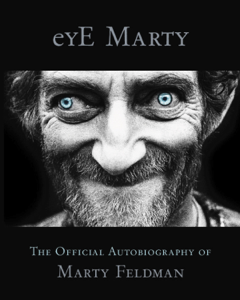 Marty Feldman really was a comic genius, and this warm, frank memoir brings that genius briefly back to us. What a crazy, inspired journey of a life he had. The book also brings back to life an amazing time in culture, when the wild art and comedy we now take for granted was first finding its legs. I loved this book, and wish Marty was still alive so I could tell him how much I loved it, and we could be pals. No one has ever made me laugh as hard as Marty Feldman in Young Frankenstein, he was pure comic perfection. He was a pioneer of comedy who inspired pioneers of comedy, a hero to my comedy hero. 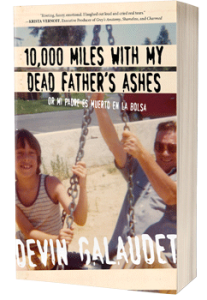 FREE GIFTS when you purchase "10,000 Miles With My Dead Father's Ashes," available on Sept 18. Sign up here to get your launch reminders and access to gifts.